McKenzie Long was the 2017 DI Indoor State Champion in the 60m event. 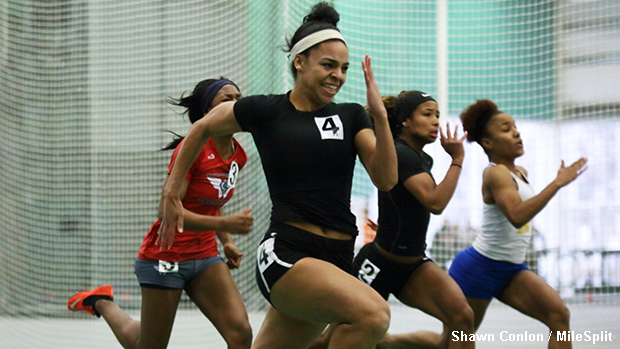 One of Ohio's premier track teams is headed to Liberty University to compete at this weekend's VA Showcase. The Pickerington Central Tigers are looking forward to testing themselves at one of the country's best meets and coach, Tremayne Peppers insists that his squad could surprise people in Lynchburg. Pickerington Central is off to an outstanding start in 2018 with several individuals among the state's leaders in their respective events. Namely, Zac Robinson resides at #1 in the 400m just ahead of his key training partner, Terry Simuel who occupies the second spot and University of Pitt Panther commit, Crockett Schooler is 3rd in the 60m hurdles due to his recent 8.22 effort at the Kent State University High School Meet #1. On the girls side, Jaydan Wood is first in the 400m and second in the 800m and senior, Mckenzie Long is second in both the 60m and 200m events. Not surprisingly, due to their wealth of individual talent, the Tigers also have exceptional relay teams, particularly the girls 4 x 200m and boys 4 x 400m who both lead the state rankings. Coach Peppers is interested in gaining an understanding for where his team stands at this early stage of the indoor season and he feels like there's no better way to find out than to have his athletes compete against a collection of the country's best. While he has high hopes for his entire squad, he notes that Jaydan Wood currently appears to be the closest to mid-season form so he's excited to see what she can do when presented with the elite level of competition that the VA Showcase will provide. Peppers also indicated that he, like most high school track enthusiasts, is interested in watching the AAU 300m invitational race that'll have the dynamic trio of Tyrese Cooper, Brian Herron and Eric Allen Jr. all competing against one another and the AAU 500m invitational race where Cooper and Herron will go head to head. Continue reading about some of the Pick Central Tigers who will be lining up this weekend.